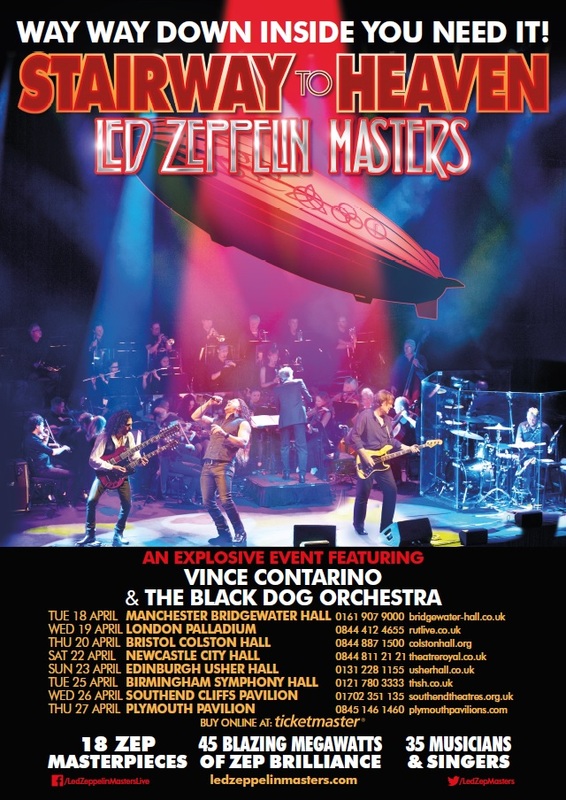 There’s a treat in store for Led Zeppelin fans next month, as Stairway To Heaven: Led Zeppelin Masters opens its UK run at Manchester’s Bridgewater Hall, prompting us to get the lowdown from this grand-scale production’s Aussie front-man, Vince Contarino. Four decades after their final major tour, there’s still a Whole Lotta Love out there for Led Zeppelin, the iconic heavy rock band that first burst on to the scene in 1968 out of the ashes of The Yardbirds. You probably know the rest – a highly-influential 12-year reign, with eight mega-selling studio albums during that period, ending with the death of drumming legend John Bonham in 1980, aged just 32. Fellow originals Jimmy Page, Robert Plant and John Paul Jones appeared together under the band name four times beyond that, first with Phil Collins and Tony Thompson on drums in the summer of ’85 for Live Aid at the JFK Stadium in Philadelphia, then three times with John’s son Jason Bonham, the last in December 2007 for an Ahmet Ertegun tribute concert at London’s 02 Arena which set a world record for the highest demand for tickets for one music show (with 20 million requests online). Unlike the other shows, that last gig brought critical praise, fuelling widespread speculation about a full reunion. Page, Jones and Jason Bonham were reported to be willing to tour and work on new material, but Plant was busy with Alison Krauss and said in September 2008 he wouldn’t be involved. Jones and Page reportedly eyed an alternative, Aerosmith’s Steven Tyler among the options, but in early 2009 it was confirmed the project had been abandoned. And I reckon it’s fair to say that … erm, remains the same to this day, not least with Page now 73, Plant 68 and JPJ 71. But there is at least one alternative at hand for diehard fans, not least those who never got the chance to see those songs performed live, and at the Bridgewater Hall in Manchester on Tuesday, April 18 you can enjoy the opening night of the grand-scale production Stairway To Heaven: Led Zeppelin Masters, featuring a full band complete with a 35-piece Black Dog Orchestra performing 18 Led Zep classics. The show’s been a huge success Down Under, recently selling out three nights at Sydney Opera House as part of a nationwide Australian tour. And its Adelaide front-man Vince Contarino is looking forward to a similar response here during an eight-date visit also including visits to London Palladium and Edinburgh Usher Hall. 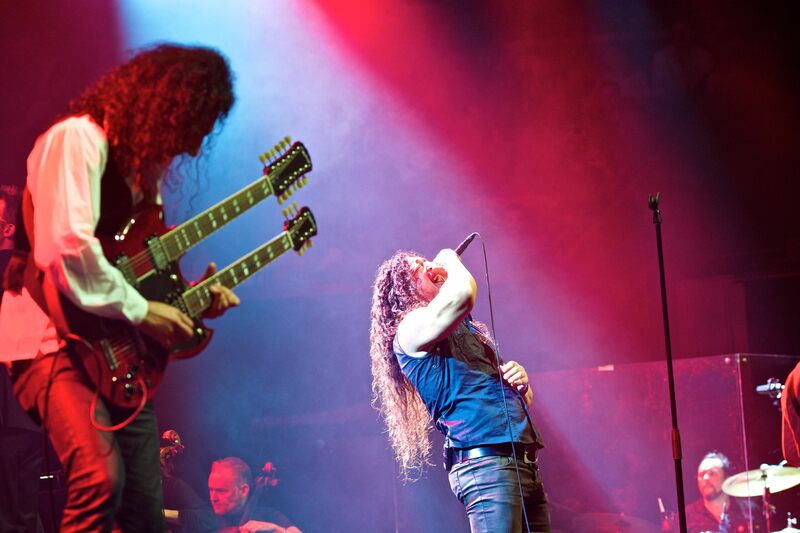 From the raw, metallic blues of Whole Lotta Love to the epic Stairway to Heaven and sheer exhilaration of Kashmir, the show celebrates the timeless legacy of this highly-influential four-piece. And powerhouse vocalist Vince tells us he’s ‘incredibly excited to finally bring this show to the UK, the home of Led Zeppelin’. Vince, who previously played with Joe Walsh of The Eagles and ex-AC/DC bassist Mark Evans as well as a band called Party Boys, is also a front-man for former Kiss guitarist Bruce Kulick’s band when they perform in Australia, and his past support roles include those with Alice Cooper, Status Quo and Stevie Marriott. 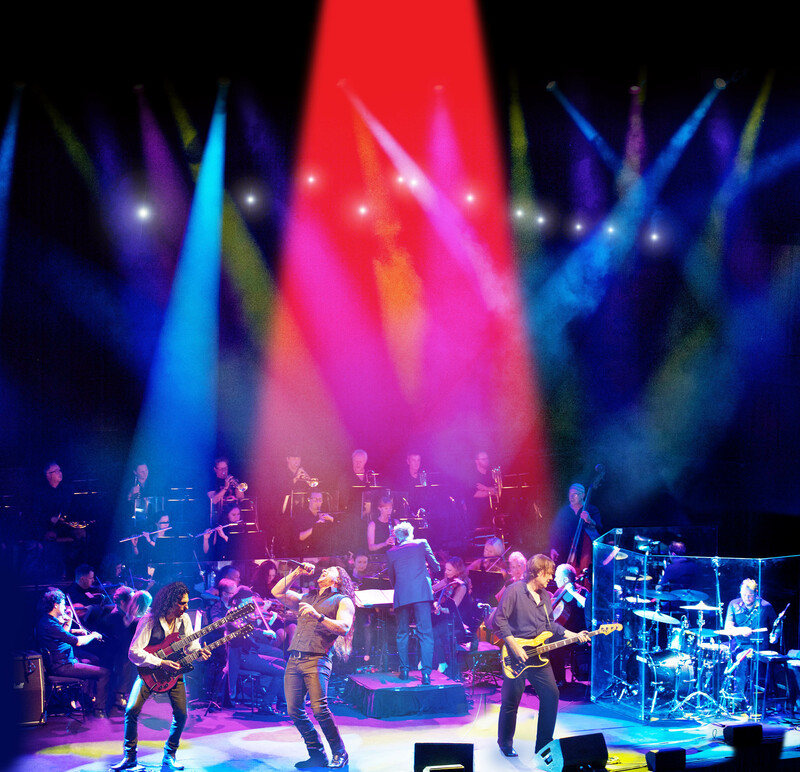 He’s not only featured in four sell-out seasons with Adelaide Symphony Orchestra and Orchestra Victoria performing orchestral versions of Led Zep songs, but also helped give Deep Purple’s catalogue the symphonic treatment, performing with late, great keyboard player Jon Lord. It was in 1997 that he turned to theatre with the cross-cultural Theatre Company Doppio Teatro, soon adding the roles of Judas (Jesus Christ Superstar) and the Pharaoh (Joseph and The Amazing Technicolor Dreamcoat) to his repertoire at Her Majesty’s Theatre. But how – we asked him – did the Black Dog Orchestra collaboration come about? 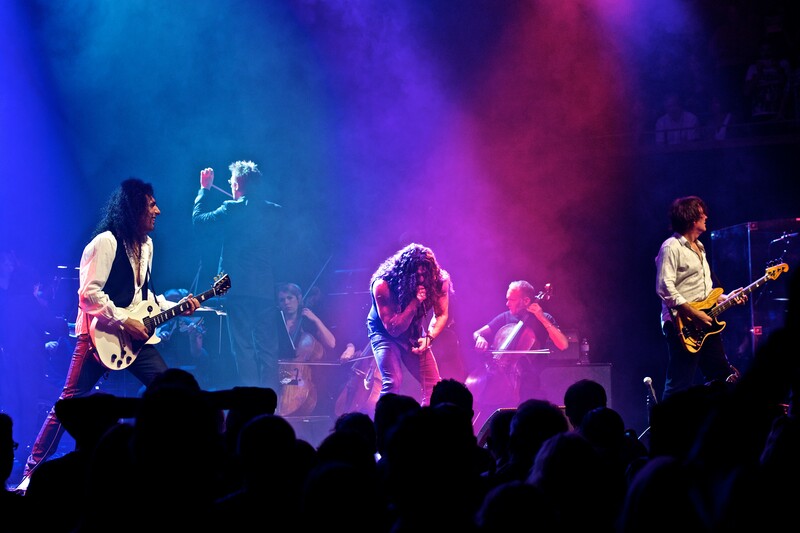 “To answer that, we must go back to 2004 when we first decided to play the music of Led Zeppelin with an orchestra. We’d been playing as the Zep Boys for almost 20 years in pubs, clubs, theatres and outdoor festivals, so were looking to do something different. “It wasn’t so much that we wanted to make the gigs bigger as much as we wanted grandeur. 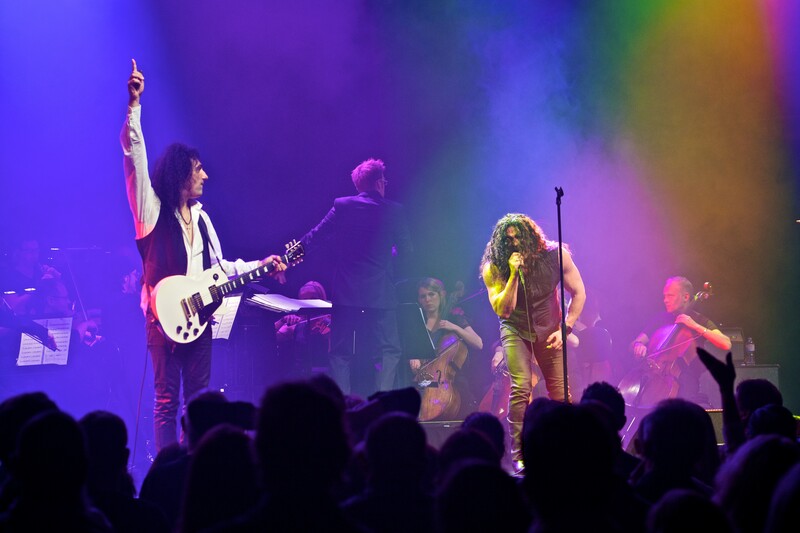 With an orchestra, we could play all the dubbed tracks on a Zeppelin studio track and, at the same time, bring together two different musical performance cultures. I’m guessing you must have been one of the first recognised tribute acts in the world? Three sold-out shows at Sydney Opera House is a testament to the reputation you’ve built in Australia. Did you ever imagine that was possible at the start? “Never dreamed or dared to dream that. All we wanted to do was a couple of shows at the local pub and have fun playing the music of what we believe to be the greatest rock band ever”. Understandably, Zeppelin fans are very protective about the music. With you also being fans, how important is it to show respect and honesty to the music and the performance? “The performance must be true to the catalogue and how those songs were recorded. Even though Zeppelin is blues-based – and blues is all about the moment and how we express ourselves individually. We believe we must stick to the script. We may express and interpret certain themes a little different from the original, but overall need to play the compositions as recorded on the albums so the audience is satisfied. We are strict on this and yet still have room to move within the confines of that material”. You don’t tend to impersonate the band but allow your own personalities to come through. Was that always part of the plan? “It was never even a consideration. We’re musicians, not actors. The music is what is important to us, not the clothes or fashion of a bygone era. The performance can only be honest if we are real and celebrate and communicate with the audience using the composition, not the alter-egos of Led Zeppelin themselves”. Does that mean more emphasis on the music and musicianship, rather than trying to play a role then? “Absolutely, the music is everything unless of course we want to take the piss. And I’d rather take the piss out of myself than Robert Plant or Jimmy Page. I have way too much respect for them”. The addition of a 35-piece orchestra adds a new depth and makes for an amazing spectacle. How did you approach the project and arrangements with the orchestra? “The arrangements are the brainchild of Nicholas Buc. He’s the man that sweated over those and has done a wonderful job – superb. We discussed dynamics and different versions of the songs so we could find a good custom fit. Compositions like Song Remains the Same and Rain Song for instance are different on the live album. Upwards Direction: No sign of the band being Dazed and Confused here. So are there new interpretations on the old classics? “Indeed, but as I mentioned some of the changes are subtle and then there are moments that come out of nowhere that simply take your breath away. That’s the wonder of music, introducing unexpected elements that enhance and lift and take you by surprise”. And finally, tell us again how much you’re looking forward to bringing this show to the UK. “Are you kidding me? We’re super-excited. We have a crew here in Australia that for logistical reasons we can’t take with us. They’re offering the blood of their firstborn to come – haha! We, the band, are beside ourselves. Some of these concert halls like Bridgewater Hall, Bristol Colston Hall and Newcastle City Hall were gigs Led Zeppelin did themselves. I’m sure they would have done the London Palladium, too. Tue 18th Manchester, Bridgewater Hall 0161 907 9000 bridgewater-hall.co.uk; Wed 19th London Palladium 0844 412 4655 rutlive.co.uk; Thu 20th Bristol, Colston Hall 0844 887 1500 colstonhall.org; Sat 22nd Newcastle, City Hall 0844 811 21 21 theatreroyal.co.uk; Sun 23rd Edinburgh, Usher Hall 0131 228 1155 usherhall.co.uk; Tue 25th Birmingham, Symphony Hall 0121 780 3333 thsh.co.uk; Wed 26th Southend, Cliffs Pavilion 01702 351 135 southendtheatres.org.uk; Thu 27th Plymouth Pavilions 0845 146 1460 plymouthpavilions.com. For a quality recent read on Led Zeppelin, this site recommends The Dead Straight Guide to Led Zeppelin by Nigel Williamson (Red Planet, 2014), an essential Led Zep companion detailing the life and after-life of the band, covering all the albums, solo albums and reissues, including an inside track on the author’s 50 favourite tracks and much more. For more details and how to get hold of a copy, head to the Red Planet publisher’s link. This entry was posted in Books Films, TV & Radio, Comedy & Theatre, Music and tagged Australia, Bridgewater Hall, Jason Bonham, Jimmy Page, John Bonham, John Paul Jones, Led Zeppelin, Manchester, Phil Collins, Robert Plant, Stairway to Heaven, Tony Thompson, Vince Contarino, Yardbirds. Bookmark the permalink. Shows how in touch I am – never even heard of this and it’s in my back yard! Mind you, I’ve never quite seen the point of tribute bands. That, however, did not limit my enjoyment of the piece. You’re right, Bruce, and I do tend to avoid tribute bands here, so I’m probably letting myself in for grief, but think this is more about the production, and love the idea of an accompanying 35-piece orchestra. Thanks as ever for your support, and for those reading this who aren’t aware of Bruce’s own site, I’ll point you straight to https://vinylconnection.com.au – an amazingly well-informed, beautifully curated platform from a true music aficionado, including two great pieces from June 2014 on the subject of a certain Led Zeppelin. Why thank you sir. You’re very kind.